When it comes to selecting the proper ammunition for your needs, there are really only two choices available. Those that are great for spending time at the range, and those that are manufactured as if your very life depended on it. The PMC 147gr 7.62x51mm X-TAC Full Metal Jacket Boat Tail was engineered for when serious threats do arise, and is guaranteed to make a statement that others will not soon forget. 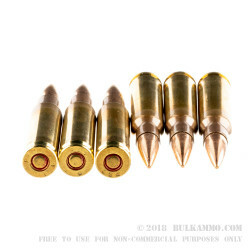 Manufactured to the most stringent of standards, the PMC 147gr 7.62x51mm X-TAC FMJBT is the only choice for career law enforcement and military personnel embedded in high threat, high risk environments where failure is absolutely not an option. The 147 grain solid copper FMJ boat tail round has a staggering velocity of 2,800 feet per second. 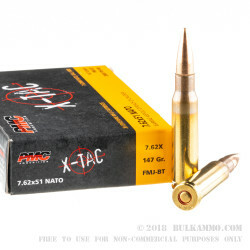 With a sectional density of .22, the The PMC 147gr 7.62x51mm X-TAC FMJBT is capable of supersonic flight out to 600 yards. Boxer style primers provide instant ignition of the precision measured propellants, and the sleek profile of the boat tail recess at the end of the round take sub-moa accuracy to the next level. 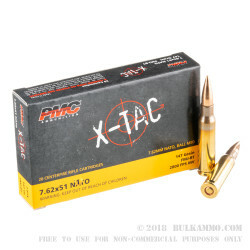 For military and law enforcement officers unwilling to settle for anything but the best, the PMC 147gr 7.62x51mm X-TAC FMJBT is your solution. 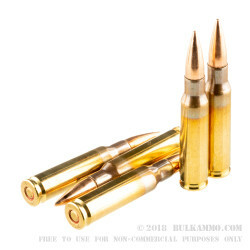 This package is for the entire 500 round case of bulk 7.62x51 ammo. Inside a factory case, you’ll find 25 boxes with each box containing 20 rounds.